This is new. 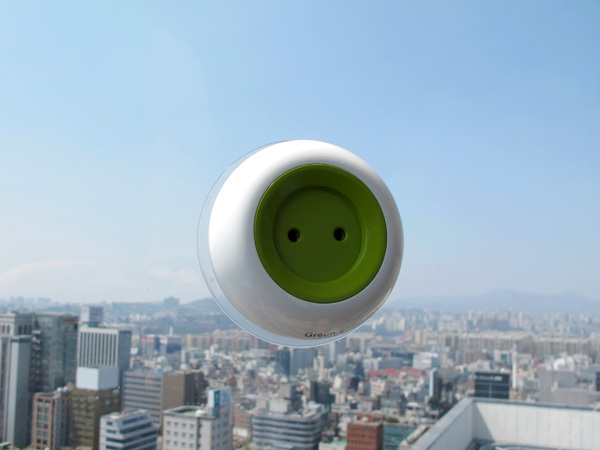 A solar-powered plug from Korea that sticks to your window and absorbs sunlight for use later. Brilliant. Unfortunately, it’s only available to European markets due to the style of the plug, but a version for the U.S. is on its way. The Window Socket is the brainchild of Korean designers Kyuho Song and Boa Oh. It’s not too powerful–yet–but it can definitely get you through the day. Just like all other solar devices, the Window Socket absorbs sunlight and converts it into electricity you can use to power small electronics, charge your phone/tablet, plug in a reading light, etc. It’s also great for driving commutes, or an overnight trip. Some suggested tweaks and modifications include eventual USB support, a bigger battery life, and universal compatibility. Currently, it takes in between five and eight hours to fully charge the device, then it will produce power for around 10 hours. That’s not bad at all, because who really stays up 10 hours past dark to take full advantage of the Window Socket? This product is intended to enable you to use electricity freely and conveniently in a space restricted in the use of electricity, such as in a plane, a car, and outdoors. Thus, this product was meant to draw out a socket used indoors outward. We tried to design a portable socket, so that users can use it intuitively without special training. It doesn’t get much simpler than that. You don’t even have to remove the Window Socket to plug into it. It’s small enough to fit in your pocket, backpack, or laptop bag, and light enough to not become a burden. When it debuted on Yanko Design, it received over 300 comments, and spread like wildfire across the internet. We’re expecting great things in Window Socket’s future. Since this is just the first prototype, and it’s already pretty incredible, future iterations should perform even more exemplary as a portable charging device for the power user.